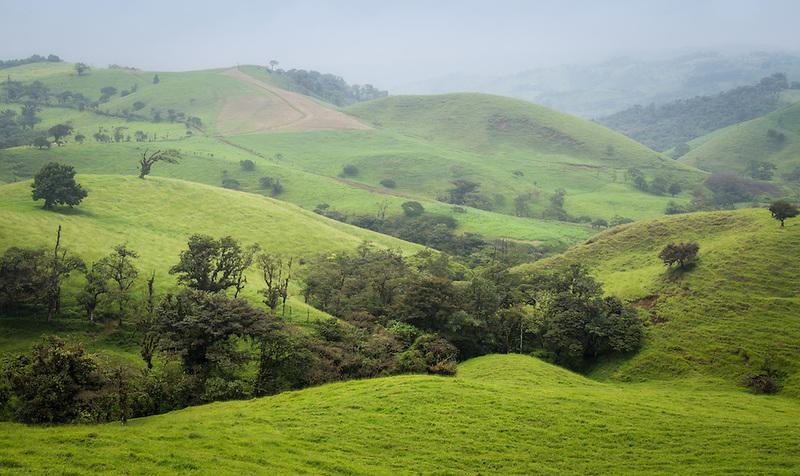 The countryside in Costa Rica is just wonderful, and the best way to enjoy it is driving around. During my visit I rented a car and after staying one day in San José I drove to the Arenal Volcano area, the total driving time is about 3 to 4 hours, but the scenery is great, the other thing is that I’ve used a different route on the way back so I could explore different areas. Driving is a little bit challenging, most of the roads are not in very good condition if you add up traversing mountains and no shoulders it can be daunting. The good thing about doing it on your own is that you can jump anywhere and anytime, and you’re not tied to any schedule, there are a number of little towns along the way and many places worth checking out. I made this photo on the way back to San José, it was taken over the route 702 close to the town of San Ramón in the Alajuela province. The morning was somehow foggy and when I saw the view from one of the many curves on the road I just needed to stop and photograph it. I like the effect of the fog in the mountains, and the contrast with the greens and shadows. Well, that’s all for now, more photos from the trip to Costa Rica coming soon. For licensing information or to order print just click on the photo.